Hello, my name is Scott and I’m a Zombieholic. 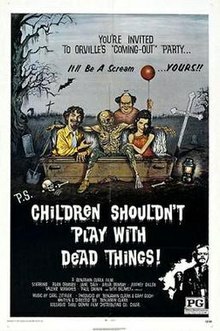 I first became hooked back in the mid-1970s when one of the local television stations in Boston broadcast Children Shouldn’t Play with Dead Things. The movie was an independent, amateur production and looked it, with some of the worst acting and make-up around. But then, half way through the movie, the dead began to rise, crawling their way out of the cemetery accompanied by copious amounts of dry ice fog and the creepiest, synthesized background score my warped young mind had ever heard. From that point on, I was addicted. Slow zombies. Fast zombies. Comical zombies. Movies. Books. Graphic novels. Video games. Like the living dead themselves, I would feast on anything zombie in order to feed the hunger. We all want to be scared, to sit in a darkened movie theater or alone in bed late at night and enter that fantasy world that sends a cold shiver down our spine. Vampires and other monsters can provide us with that same thrill, so why are zombies so much more terrifying? Because with vampires, all you have to do is survive until morning, and then the threat is gone. With other monsters, once you kill off the creature, you’re safe and can go about rebuilding your life. The living dead, however, represent our worst nightmare – the apocalypse, the complete breakdown of society and its civilized norms. A zombie outbreak would result in a battle of survival between us and thousands of creatures that know no fear, no pain, no emotion, only the desire to feed off of us. One trend within the genre that has become increasingly popular in the past several years is the idea that the worst part of a zombie apocalypse isn’t the rise of the dead but how the survivors will react. This concept has always been around, going back to George Romero’s Dawn of the Dead (1978), and has been a staple of the genre for zombie aficionados. What made this concept popular amongst mainstream viewers/readers, however, was the devastation of New Orleans following Hurricane Katrina and the total breakdown of authority in the aftermath of the storm. We all watched live on cable news the destruction of a large, famous city. The complete breakdown of local, state, and federal governments and their inability to help the victims or maintain order. And man’s basest instincts playing themselves out uncontested inside the Superdome. For the first time, we realized that an apocalyptic event could touch anyone of us and that, rather than work together for our mutual benefit, society would more than likely turn on each other. It left most of us with a sense of unease because that event drudged up our deepest fears about the end of the world. It’s those fears that zombie fiction taps in to. Is the zombie phenomenon on its last legs? Not at all. We’re not going to see various subgenres of zombies (anguished zombies with souls, glittery zombies, zombies dating teenage girls) that will keep the genre going. We don’t need to. As long as the fans are terrified by the end of the world, then zombies will provide them with a terrifying and exciting why to exploit that fear. And guys like me will try to get as many people addicted on the living dead as possible. ABOUT THE AUTHOR – Scott M. Baker was born and raised in Everett, Massachusetts and spent twenty-three years in northern Virginia working for the Central Intelligence Agency. Scott is now retired and lives in Gainesville, Florida as a full-time writer along with his wife and fellow author Alison Beightol and his stepdaughter. He has written The Vampire Hunters trilogy, about humans fighting the undead in Washington D.C., as well as Rotter World, which details the struggle between humans and vampires during a zombie apocalypse. In early 2014, his fifth novel will be published; Yeitso is his homage to the giant monster movies of the 1950s that he loved watching as a kid. Scott is currently working on the next two books in the Rotter World saga and a series of young adult novels set in a post-apocalyptic world. Scott has also authored several short stories, including “Rednecks Shouldn’t Play with Dead Things,” “Cruise of the Living Dead” (zombies aboard a cruise ship), “Deck the Malls with Bowels of Holly” (an alcoholic mall Santa battles zombie reindeer), “Last Flight of the Bismarck” (steampunk zombies), “The Hunger” (cannibalism during a zombie apocalypse), “Lebenden Toten at the Gate” (Nazis versus zombies in Stalingrad), and the novella Dead Water. When not writing, Scott can usually be found doting on the two boxers, one house rabbits, and one cat that kindly allow him to live with them.